We have a new and improved API for ONTRAPORT users. You can find the explanation HERE, and the interactive testing environment / documentation HERE. For the examples below, we've added the equivalent calls using the new API (where available). While we don't have any plans to disable the old API, we do suggest switching over to this faster, more powerful version. Please note that with the new API, authentication is handled via the request headers (as opposed to being passed in the POST data). 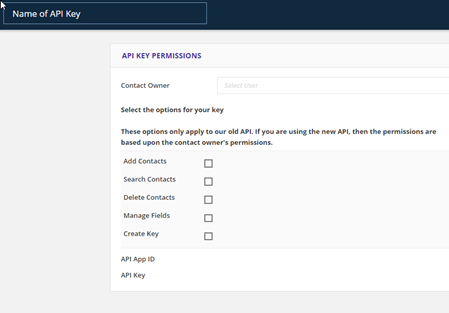 Use of the Forms API requires an API App ID and API Key. These can be generated within your ONTRAPORT account by going to Account > ONTRAPORT API Instructions and Key Manager. Also, be sure to select the appropriate permissions for the key you are about to generate (for example, if a key does not have "add" permissions selected, it will not be able to be used to add type requests. Currently we use REST Requests to handle requests to the web server. Typically XML data is posted via POST to the feed URL and a 'success', 'failure' or 'return data' will be returned depending on the type of call. REST supports a number of web server environments for development, and it's a pretty easy system to learn. Learn all about REST. The post URL is comprised of the API address (in this case, http://api.ontraport.com/cdata.php) along with the following paramenters. The fetch request works in one of two ways depending on if an optional form id is passed. If no ID is passed in the request, the call will return a list of all forms in the account along with corresponding form IDs. If a form ID is passed, the call will return the hybrid version of the smartform code.